Video: Choosing between different types of coffee grinders. Choosing between different types of coffee grinders. The coffee grinder you choose will depend both on your budget and on your desire to get the very best flavor from your coffee. Which type of grinder should you choose? 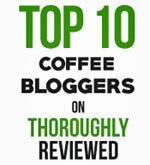 Well, if you are buying anything but the cheapest whole coffee beans, choose a burr grinder. A blade grinder simply whacks the beans to pieces. The problem with that is that it leaves a mess of ground coffee with very uneven sizes of coffee grinds. Some have been whacked over and over and are as fine as talcum powder. Other parts haven’t been hit by the blades as often, and are much larger. 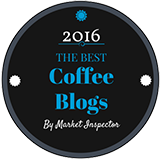 The uneven size of particles messes up the extraction process when you brew the coffee. The tiny particles of coffee lead to over-extraction, and the bigger pieces are under-extracted. The end result is a brew that misses the best qualities of the beans, and exaggerates the qualities we don’t want, like too much bitterness. If you are into coffee and really care about the taste, you should always go for a burr grinder. These grinders can be adjusted at different settings, between very fine for making Turkish coffee, fine for making espresso, medium for use in a drip brewer and coarse for use in a French press. More important still, the grinds are all pretty much identical in size, so you don’t have that problem with uneven extraction. Sure, a blade grinder is cheaper. But if you are paying for better than awful coffee beans, the extra cost of a burr grinder will quickly reward you with better-tasting coffee. 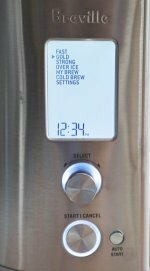 For more information about the conical burr coffee grinder shown in this video, check out the Capresso Infinity. 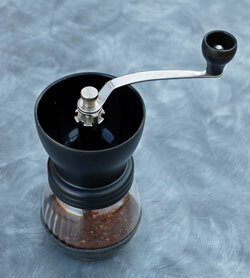 The hand coffee mill in the photo is the Kyocera Burr Grinder.